eReader1: Tip #20: Kindle Collections.... how do you use yours? Tip #20: Kindle Collections.... how do you use yours? Update: This tip works for Kindle e-inks, 2nd generation (2009) and up. It does not apply to kindle apps or the Kindle Fire. This was was initially written for Kindles with a keyboard and 5-way controller. For touchscreens, the 5way instructions are tap/ hold to get options. The long awaited Kindle "folders" are here for Kindle and with a far easier way to organize your ebooks on your Kindle homepage. A little different to folders on a computer and are named "Collections". It's simple to create new collections from your Home page menu. Click Menu > Create collection and type the name you want to call it. They may be based on genre, author, your ratings (good/ bad) or a combination of all of these. 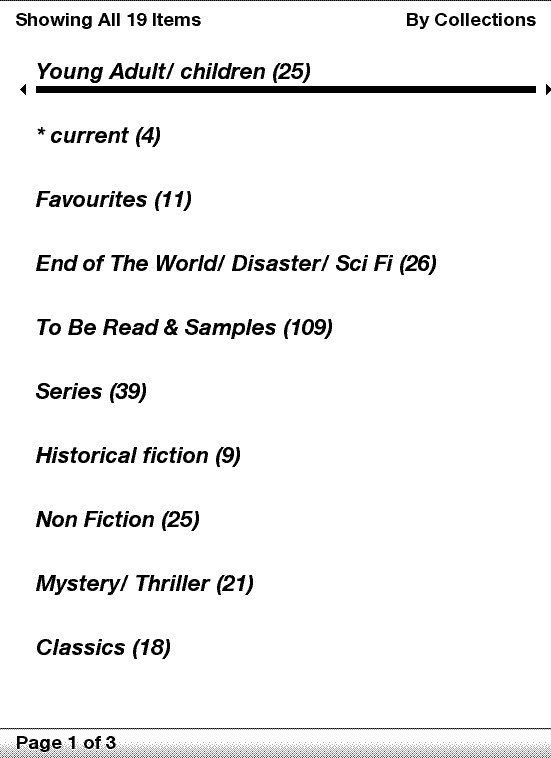 I have quite a few collections based on my reading tastes, but at least 2 collections that seem popular are "current reading" and "to be read". I debated having a "rubbish pile" too but decided to simply delete books I hate. Scroll to the title on your home page, flick the 5 way to the right and click Add to Collection (see left). When your collection list comes up, scroll down to the one you want and click the 5 way. A check mark appears when it has been added. 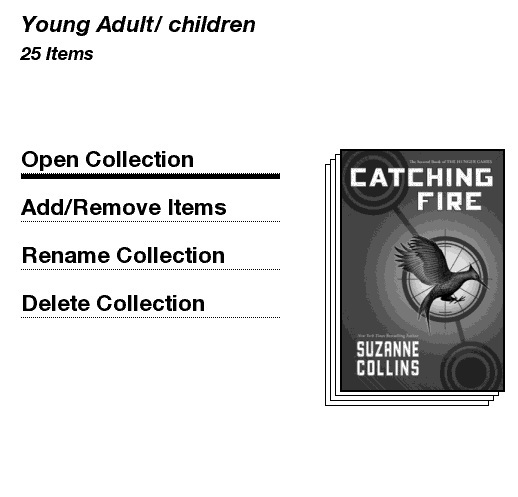 You can add the book to as many collections as you like, so it can be in favorites and classics at the same time, or in children and series at the same time, for example. Note: When adding samples to collections, be careful not to click Buy This Book - for samples, this link appears above Add to Collection and if you have wireless turned on, you might buy a few by accident! Luckily Amazon are very forgiving and will refund you for your error if you let them know within 7 days. Scroll to your collection, right click and you'll see this page (screenshot right). When done, simply scroll to the word Done and click it. Or click HOME. You may still organize your books the "old way" - that is, by title or author. You can no longer organize by subscription or personal documents. These all appear with your books. To remove Books from your Kindle's Home page, then you need to sort your home page By Collection... this will leave behind Collections and unsorted books. If you organize by collections (left), then they appear in the order of Most Recently First. You cannot organize collection names alphabetically on your home page, even if you use asterisks in front of the name. For ultra neatness, I keep my *Current reading folder open all the time (see below). That means when I turn on my Kindle, it's a clean uncluttered page with just a few books on it. 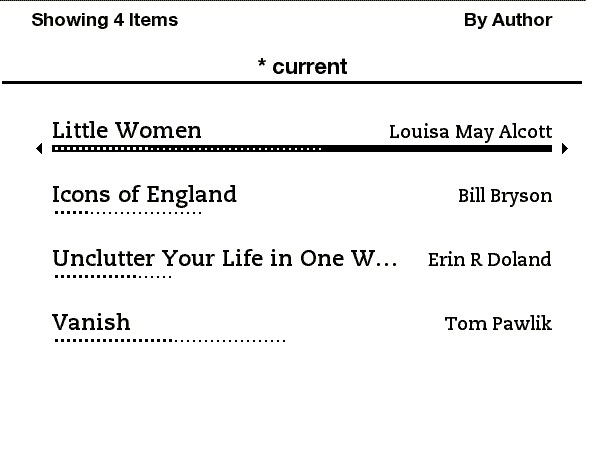 Within collections, you can continue to organize by Most Recent, By Author or By Title. In the screenshot above, I have it organized by author. That's what I prefer for many collections, especially my collection for Series so all the books in a series are grouped together. 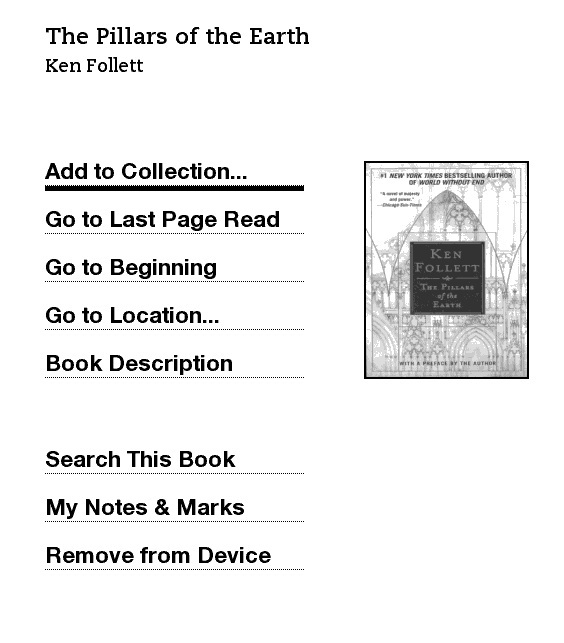 I just purchased a Kindle, and am following the instructions to add a Collection, but there is nothing that says "add a collection" aftering clicking the Menu button from the Home page. Any thoughts or suggestions? At Menu on home page, it should say "Create Collection". To Add to a collection, click the book name itself and flick the 5 way to the right. If not, check what version you have, by going to MENU, Settings, and then at the bottom of the page, it will say version 2.3 or 2.5 etc. Thanks for the article! Just updated to 2.5 and this gave me a clear idea of how to best use the new collections feature :-). With both my wife and I having Kindles and "sharing" an account, do you have any suggestions for organizing when two people share the same account? Are these collections just for my Kindle or are the for my account? ie can/will the be seen on Kindle for PC/iPhone/Android someday? The collections are purely for your Kindle home page, which means they can be 100% personalized. That way, you and your wife may categorize differently. On the Kindle it's important to note that collections are not the same as folders. It's more like a tagging system, so that on your Kindle, you tag name a book say "Favorite". When you click that collection, it brings up all of your "favorite" tags. 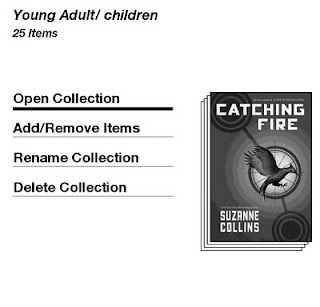 If you delete a "collection" it will NOT delete the books from your Kindle. They will just go back to your Home page. Likewise, if you or your wife change a collection on your own Kindle, it won't affect the other Kindle, or any device. For "Kindle for PC" I just have a Kindle folder on my desktop, and within that I have folders for my ebooks. Why do my book titles still show up on the home page after I have added them to a collection ?? Is this the norm, or can I do something to get rid of them ?? There are a few ways to sort your home page. If it's sorted By author/ by Title, then they will still appear on the Home page. You can check at the top right of your home page. To "get rid them" you need to sort By Collection. At the home page, use your 5 way to move to the very top of the page, then click right. Scroll to collections and click to select it. Now your collections should be on the home page. As you add books to collections, they should disappear from the page. 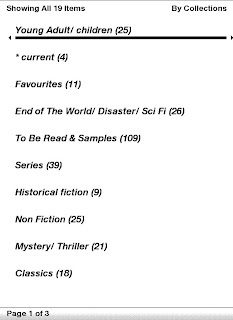 I called eachbof my collections by a name that begins with a NUMBER so that I could use Sort by title and still have all my collections show up in my home page, followed by a list of books in alpha order. That's a great idea Dana. Thanks for letting us know! There are several books in a "series" and I want to somehow keep them in the order they should be read. I made a "Collection" for them but I can't get them to be in the order that they should always be so I can open my collection and know which book is book one. Any ideas on how to work around the sort option in collection? I have the Kindle 3. My e-mail address is herlis-sherri@juno.com if anyone has any ideas. Anon, that's a great question. I have not tried this but I have seen other Kindle owners discuss the program Calibre. It's an e-book management program that you download to your computer, and you can move ebooks to and from your Kindle via the Kindle USB. 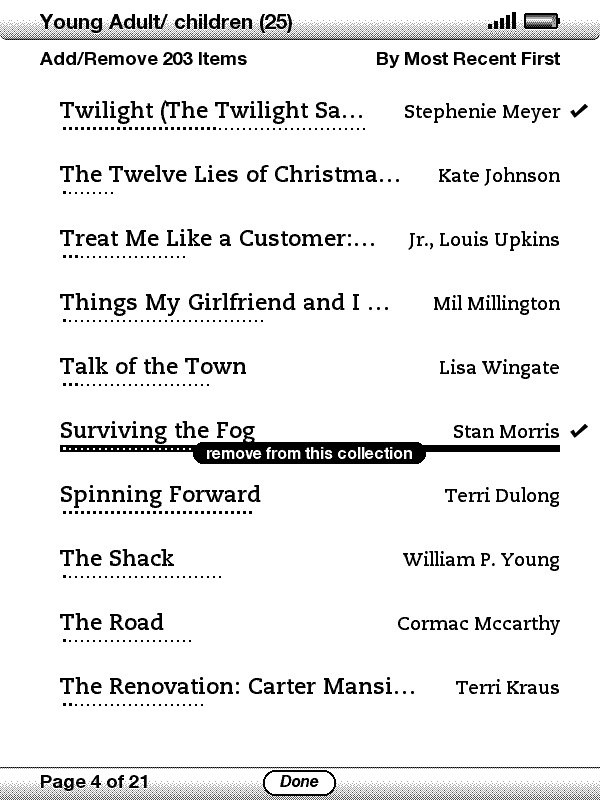 I believe Calibre allows you to edit the names of your books, so allowing you to add numbers to the name. Then when you sort the collection by Title, they should appear in order. If you google Calibre, you can find it pretty easily, as well as reviews and discussions about it. Hope that helps! I just received a Kindle 3 and "Create a Collection" menu is grayed out. Congrats on getting your K3! It's my understanding that the Create a Collection option is only activated on i) a Kindle that is registered, and ii) has done its first sync. To check that it's registered, go to your account online with Amazon, or from your Kindle's Menu > settings. Just reading your comment about Calibre... but isn't it possible to transfer and rename books just using the USB cable anyway? Why do you need special software for this? 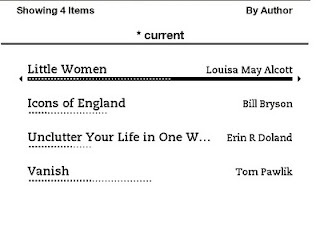 And a related question - renaming personal documents is obviously fine, but what happens if you rename a purchased book? Will it stil be recognised for online archiving, or for bookmark/note/etc synching? Changing the book name on your computer and then transferring doesn't have any affect on how it appears on your Kindle screen. I have no idea why. As for changing them and how it appears online archiving: I don't know and I will try to get an answer for that. I think note/ bookmark syncing would be fine for 2 reasons: the name of the book itself isn't what Kindle recognizes. I've tried to buy books that were updated and had their names changed, for example, but cannot as it says I already bought it. So there's some info within the ebook itself that Kindle recognizes. Also notes/ bookmarks that are saved in a ghost version of the ebook, that is specific to your Kindle. If you ever get a new Kindle, you cannot transfer your book and notes to it. A brand new version gets sent to that new Kindle and your notes/ bookmarks stay with that old version and old ghost file, again suggesting to me that title it irrelevant, there's something else in the file that is being recognized. I'll look into it though. I don't use Calibre, so I don't want to give any wrong info. How do you delete a collection? go to the HOME page, scroll to the collection. Use the 5-way to click right, and you'll get options: Open, Add/ Remove, Rename and Delete. Scroll to DELETE and click the 5 way. I have a new Kindle 3 and am trying to create a collection. It is registered but I do not have a way to connect it to WI-FI. I live in the National Radio Quiet Zone and within 10 miles of the National Radio Astronomy Observatory. Therefore it is unlawful to have WI-FI. Does anyone know how to get around the requirement stated above to make a sync? I download all my books from my computer over the USB. If WiFi and 3G are banned in the area, the only options I know are by USB. When you are out of area, you can do a sync. I did that for a while with my 3G-only Kindle 2. I had no 3G signal at my home for the first few months of 2009, so I would take my Kindle into town with me and sync from there once a month or so. Danielle the reason that just changing the filename doesn't work is that the Kindle isn't actually showing you filenames when you look at your books, it is showing you the metadata information that is stored within the book file. That is why you need a special program to change the information. I've added about 26 titles to a a collection I've named Classics. When I go Classics>Add/Remove Items, I see a screen full of the already added items. How add the remaining 20 Classic titles without having to go to each individual book? It says Page 1 of 6 at the bottom of the screen, but there seems to be no way to advance to Page 2 of 6, etc. The directional arrows don't do anything, Home sends you home, Menu gives Turn Wireless off, Shop, and Add All Items on this Page (they're already added). It's probably something obvious... Thanks for any help! Hi, when you are at the screen that shows page 1 of 6, use the Next Page button to turn, not the directional arrows. That should do it for you. You can also sort that page by title/ author by scrolling to the top and clicking right. I always put my books in collections, especially if they are part of a series, with more info on the book itself (I use Calibre and LOVE it!). For example, If I am putting Nora Robert's Sign of Seven Trilogy into a collection it looks like this: Nora Roberts (Sign of Seven) Within the collection itself I have edited the metadata in Calibre to show which book number it is in what series so that if it is not in a collection or I am adding a lot at a time I know where to place it. So the books would show as "Blood Brothers [Sign of Seven 1]. Doing it this way allows me to go straight to whatever series I feel like reading instead of viewing all of a certain author. Calibre has an option to put the series its in and book number but it doesn't transfer to the Kindle that way, which is why I place series and book number in the title. The other benefit of Calibre is if you have a PDF file or books in other formats, you can convert them to be read on the Kindle (if there is no DRM on the book itself). I love the point of opening the collection and then adding books. This is so much quicker for adding all the chapters from college text books. Thanks very much. Is there any way to organize the archive or search in it? When I try searching in it I only get results from my device collections. I like moving books I'm not going to read anytime soon into the archive, but now I have a growing and unwieldy list in there! You can organize Archives by Author or By Title, alphabetically. Scroll to top then 5way right to get to the options. Then to quickly find a book, type a letter and click the 5 way enter (center) to go to that part of the alphabet. I now also have a K4 and I'm treating things a bit differently. Instead of separate collections for series and/or authors, I only have 4 collections: Next in Series, Fiction, Non-Fiction and Samples. I read a lot of series, so I just keep whatever's the next book in a given series on the K4. The rest are in Calibre for me to move over when I'm ready. Keeps my Home Page a lot cleaner. I haven't moved all the fiction & non-fiction over from Calibre yet, but I've got the ones that are highest on my want-to-read list - I have a serious case of EBHD - E-Book Hoarding Disorder. So Calibre is definitely my friend. Thanks for sharing that Emily. I too have changed my collection habits a bit, though I use the App for PC rather than Calibre. Then I sort on the pc, in big batches. I think calibre is more powerful probably. I just recently got the Kindle Touch and I really love it. I even got it organized the right way from reading this blog. My only problem is the numbering of the collections. They went in order of how I wanted them up to #9..However when I went to number a 10th collection it went under the 1st collection rather that after the 9th collection..Anyway to get around this? It goes #1, #10, #2 etc. Yes, there is a way around it. Unlike Kindle Keyboard (where sort by collections is done by most recent), on the Kindle Touch collections are sorted alphabetically. So, 10 is before 2.